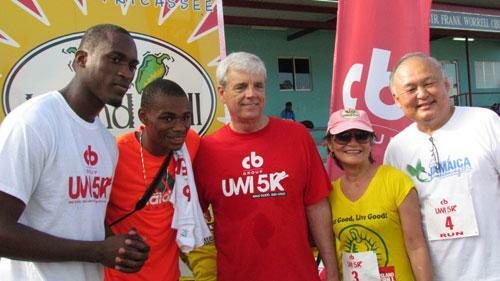 The inaugural CB Group UWI 5K Run/ Walk event, under the theme ‘Walk Good, Run Great for education and sports development’ was held on Sunday November 18, 2012 at the University of the West Indies. 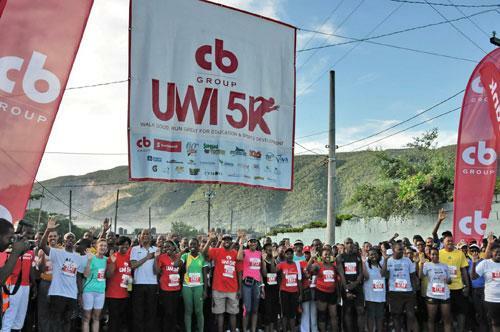 Professor Gordon Shirley, UWI Principal and co-patron of the CB UWI 5K, expressed surprise about the large number of persons who registered for the event. “I expected about 1000 people, and to have almost 3000, really exceeds all of our expectations. The spirit of the event was really wonderful. Everyone seemed to enjoy themselves", Professor Shirley noted. Along with the many students participating, business persons, government officials, dignitaries and diplomats also partook in the event. Amongst the dignitaries present were: Ambassadors from China, Mexico, Spain, the United States of America, Brazil and Columbia; the former and current High Commissioners of Canada; the High Commission of South Africa; former Governor General, Sir Kenneth Hall and Lady Hall; Member of Parliament for St. Andrew Eastern, Andrew Hylton; and Minister without Portfolio with Responsibility for Sport, Natalie Neita-Headley. High patronage, along with an outpouring of financial support from corporate Jamaica, the UWI alumni community and other personal contributions, will go towards assisting organisers in realising their goal of raising funds for student scholarships and the further development of the University's sports complex. The event's organising committee is now working to tally proceeds to measure their success in reaching their target of J$8million. Event sponsor, Thalia Lyn, CEO of Island Grill, explained, “It turned out very well in that we got a buy-in from so many people. It wasn't just corporate Jamaica, but we got diplomats out as well as students. So it’s a legacy that we really want to leave behind to raise money for such a wonderful cause.” Lyn is also co-chair of the Grand Jamaica Homecoming Committee, the group that both conceptualised and birthed the event. The CB UWI 5K was also highly entertaining with on-stage festivities led by energised radio personality, Jenny Jenny. Yoga was a large feature of the event, with yoga stretches before, during and after the race, led by members of the Jamaica Yoga Association. Highly revered Jamaican track & field coach, Glen Mills was honoured at the event, with an award and a portrait done by Howard Moo- Young presented by Professor Gordon Shirley. Olympians Warren Weir and Hansle Parchment were in attendance to recognise the hard work of Coach Mills. Douglas Orane, CB UWI 5K co-patron and Executive Chairman of GraceKennedy Limited, was very happy with the day’s proceedings. “The stars have aligned and this event has come through. It is wonderful to see all the ingredients were there just waiting for it to happen. 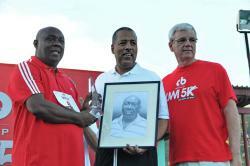 It sets the foundation for us to do this every year now, repeating in 2013,” Orane said. Shawn Pitter clocked 14 minutes 10 seconds, winning the male section while MVP member Tanice Barnett was the winner of female section in a time of 17 minutes 43 seconds.